Tina Nancollas designed and regularly maintains St. David‘s website. During my seven years as Parish Manager I have found Tina to be a reliable resource on many computer related issues. Tina has the ability to easily work with the many different formats I submit each month for posting to the website. 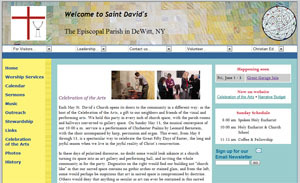 Because of her efforts St. David‘s website has become an increasingly important communication tool for the church. She conducts herself in a professional manner and is a pleasure to work with. Tina has been very professional throughout all of our web site design revisions over the last eight years. She‘s a great listener, works to understand our needs, and delivers on time. She always remains very accessible when working on a project and offers creative solutions to any problem. I highly recommend Open House Website Design. The thought of building a web presence was so overwhelming that day after day I put it off. I'd start it on my own and then find myself doing anything else...really...anything at all! Then one day I asked Tina for help and the cloud lifted. She gave me clear and effective direction and I never once felt I was doing something weighty or difficult. It became fun to explain the site to her and see it come to life in her hands. I met Tina more than 38 years ago and she has always been among the most reliable and creative people I've known. It's just amazing having the opportunity to work with her now and I encourage anyone ready to create a substantial web presence to use the services of this artistic woman! You did a terrific job with the website; I am very pleased with it. It's running smoothly on the computer as well as my smartphone. I also want to thank you for your patience with it and me. Often I didn't exactly know what I wanted, but with your suggestions the site was all the better.